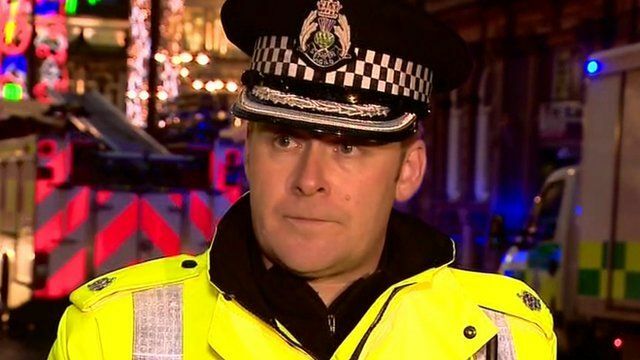 Police: 'A number of fatalities' Jump to media player Police have said that a number people have been killed after a bin lorry crashed into pedestrians in the centre of Glasgow. Bin lorry 'ran up on pavement' Jump to media player There are reportedly several people injured after a crash involving a bin lorry in George Square in Glasgow. Fatalities in Glasgow bin lorry crash Jump to media player Several pedestrians are feared dead after a bin lorry crashed into a group of people in George Square in Glasgow city centre. Police have said that a number people have been killed after a bin lorry crashed into pedestrians in the centre of Glasgow. Police said that the vehicle crashed into people at several different locations as it travelled down Queen Street before colliding with the Millennium Hotel. Police Superintendent Stewart Carle explained what happened.